Afford Yourself The Good Night' Sleep You Deserve - Starting Today! Is your nightly rest ruined by back, shoulder and neck pains - the telltale signs of a bad sleeping posture? Aren't you sick and tired of the burning sensation and pain of acid reflux and heartburn? Well, we got your back! This orthopedically designed pillow may just prove to be exactly what you've been looking for! One of the top reasons of bad sleep quality is wrong body posture - and this is exactly what this great bed wedge pillow was designed to correct! By providing support to your head, neck, and shoulders and elevating your upper body, the ergonomically shaped pillow improves your posturing and relieves you of muscle and back pains, allowing you to enjoy the good night's sleep you deserve. What's more, the angled and elevated position of your head will make breathing much easier. So, What Are You Still Waiting For? Order Your Own Premium Bed Wedge Pillow Today! ✅ TURN YOUR BED INTO A COMFORTABLE RECLINER - By improving your body posture and supporting your upper back and shoulders, this bed wedge cushion can relieve you of back and neck pain, as well as aid you with breathing and snoring issues. 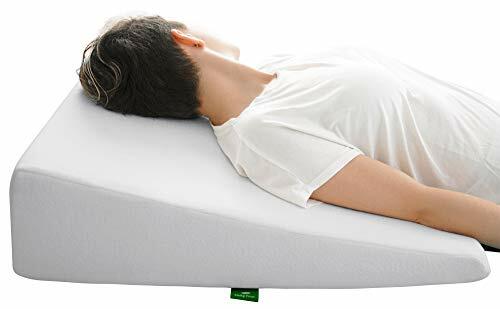 ✅ IMPROVE YOUR OVERALL HEALTH - This bed wedge riser promotes a better sleep position and prevent orthopedic health issues with your spine, neck and shoulders. Multipurpose and adjustable - enjoy the perfect angle degree as an anti snore pillow, position the wedge upright while watching TV or reading - or you can even use it for leg elevation! ✅ HIGH DENSITY MEMORY FOAM TOP - To maximize comfort and fit your body's shape as best as possible, the bed wedge pillow features a layer of high density memory foam. The foam contours to your shoulders, neck and head, offering you a uniquely comfortable slope for a restful experience. Wedge measurements are 26 x 25 x 7.5 inches. The Cushy Form Wedge is firm and will not collapse under your body. We recommend using an extra pillow on top for neck and head support. ✅ BREATHABLE & WASHABLE COVER - In addition to its comfortable memory foam layer, the bed wedge pillow has a soft and breathable cover. Not only does it help it maintain a comfortable temperature, it's also easily removable and machine washable! If you have any questions about this product by Cushy Form, contact us by completing and submitting the form below. If you are looking for a specif part number, please include it with your message. Acid Reflux Wedge Pillow - USA Made with Memory Foam Overlay and Removable Microfiber Cover"BIG" by Medslant. Recommended size for GERD and other sleep issues.